Son Troy was moving back to Southeastern Wisconsin from Minneapolis with cat Noche to live with soon-to-be wife Leah and son Noah and needed help. He planned on packing his stuff into a 14-foot U-Haul truck and towing his 2003 Mazda Protege behind but that proved expensive, so I offered to drive his car back while he drove the U-Haul. Neighbor Larry has a second home north of Minneapolis, and my first thought was hitching a ride with him. Unfortunately, he was heading up well ahead of Troy's schedule. Second thought was taking a Greyhound or Badger bus, both comfortable and convenient, but then a third possibility--Amtrak--occurred to me. Money is always an object when you're a working stiff, so I checked and discovered a one-way coach ticket from downtown Milwaukee to the Twin Cities costs $93.00. Not bad given the ride--unlike going by bus--would take me by places I hadn't seen before. 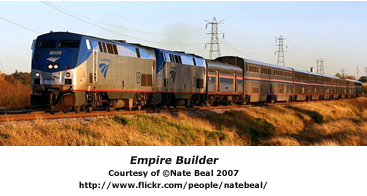 The train bore the impressive name, 7 Empire Builder, departed at 3:55 p.m., and would travel 333 miles over six and one-half hours before reaching my destination. The 7 derives from a numbering system that assigns numerals based on direction--trains that travel generally southward or westward bear odd numbers, those running northward and eastward are even-numbered. 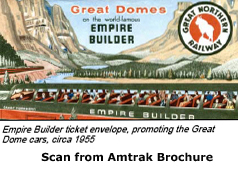 Amtrak promotional brochures indicate the Empire Builder has operated since 1929 and crosses six states on its 2,200-mile-route between Chicago and Seattle. 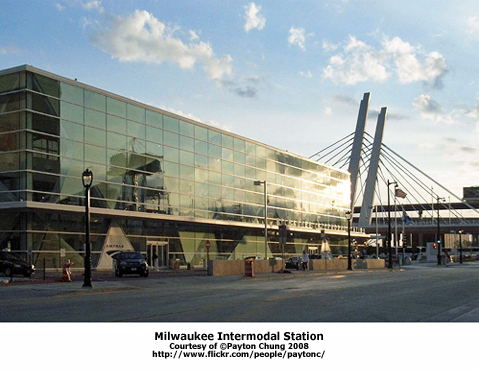 When I arrived at the glassy Milwaukee Intermodal Station, I encountered throngs of people waiting in a several-abreast line that began at the platform doors and curved deeply into the lobby. My first thought was all these passengers were on my train, and it was probably crowded due to the upcoming holiday. Most were college students, but there were plenty of older adults, including what appeared to be an extended Amish family, men with beards and suspenders, women wearing 19th-century bonnets, and some similarly dressed boys and girls. Evidently train travel is permitted by their religion, I thought--maybe because trains were around in the 1800s--but later I learned that they also occasionally travel by automobile or bus. A PA announcement soon made clear that the crowd was waiting for the Hiawatha to Chicago not the train I was on. After it departed, another announcement invited Empire Builder passengers to begin boarding. Passing through the aluminum-framed glass doors that separated the lobby from the platform, I was greeted by a long Amtrak train, and a conductor who asked where I was headed: "Twin Cities." Pointing eastward, he said, "You're in the last car." At the top of the boarding stairs, I looked down a large and airy cabin with plenty of storage space. I threw my duffel bag on an empty seat and sat down. The car was about three-quarters full when the train began moving exactly on-time. There was no movie cry of "All aboard!" One of the many cool things about rail travel is the scenery next to the rails that can't be seen from streets and highways. Not far from the station, a number of tracks abruptly ended in mounds of sand, probably designed to stop wayward trains. All along the route, urban graffiti decorated the sides of viaducts and other passageways. Every artist wants an audience, I suppose, and some have none more willing than passengers gliding past on a train. From the locomotive, I heard the distinctive whistle blowing now and then, but it was less distinct than the sound I often hear from our house in Brookfield, which is about a mile from the track I was on. As the train rolled out of Milwaukee, a man took the seat next to me, said he had been in the lounge car, extended his hand, and introduced himself as Chester Meriwether from Southfield, Michigan, a suburb 15 miles northwest of Detroit. I told him I lived in Brookfield, and we'd soon be passing Wirth Park in the heart of my 'burb. And there it was, right after Pilgrim Road. Countless times I have waited at that crossing while a silver and blue Amtrak train clattered by. Looking out the window along the south side of the track as we continued west I saw something I hadn't seen before in the city where we've resided for 21 years--evenly space utility poles holding old-fashioned glass insulators but no wires. They were no longer needed I guessed, displaced and made surplus by newer technology. Taking them down was probably judged to be too expensive. 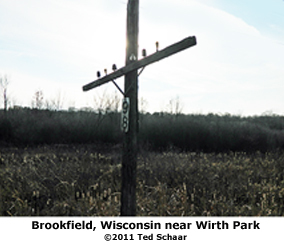 In the 50s and early 60s, when my parents regularly took the family to Tigerton in Shawano County, Wisconsin, I saw hundreds of poles like these paralleling railroad tracks along the highway, all with wires hanging from what I remember as blue-green insulators. Always thought the color was cool. 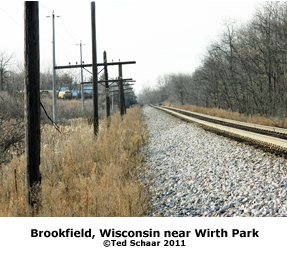 Later I discovered that the poles lining the way through Brookfield originally held wires used in a now obsolete, railroad-owned communications system. Chester was interested in the areas we were passing and asked about the cost of homes. He said he owned a beauty salon and clothing store back home, and though the Detroit area was hurting, he was hoping for the best. Very quickly we reached the outskirts of Pewaukee, and I could see the lake to the south. Chester asked how much the homes on the shore were worth, and I speculated "many hundreds of thousands." I decided to check out the lounge and began walking toward the front. Moving from one car to another requires going through sliding doors at the end of one and the beginning of the next. It's a little weird at first but becomes second nature. Along the way I passed through sleeping cars and could see narrow beds beyond some of the slightly open compartment doors. The lounge car had an upper, domed seating area with curving expanses of glass. Large chairs and tables were available on a first-come-first-served basis. Colors were muted and didn't compete with big views of the passing landscape. 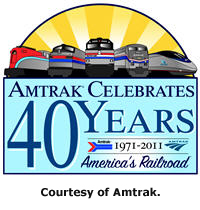 Many Amtrak cars are double-decker (the Empire Builder brochure calls them "bi-level Superliner equipment"), and in the lower part of the lounge car, an alcove held a beverages and snack food service. Domestic beer was $5.00, imported, $6.00. Returning to the upper level and taking a seat, I wrote, "Cool way to travel," and watched the pastures of plenty and the backs of small town businesses and houses out the window. It was fun to see vehicles waiting at crossings rather than being inside one as the train went by. Two matronly ladies near me were talking about the dining car, so I asked what they thought of the food. They recommended it and mentioned I needed to reserve a seat. Just then female and male conductors approached together, and I inquired about making a reservation. They asked my name and said they'd get back to me. The train stopped briefly in Columbus and then rolled on to Portage. I noted the time was 5:30 p.m., and it was still light out. The lady conductor returned and said my dinner reservation was for 8:30 p.m.--late for me, but I decided it would be worth it to experience eating in a "fancy dining car" like the one Johnny Cash sang about. I walked down to the lower level snack bar to get a bag of peanuts to tide me over. Ahead of me were a mom and two teenage boys--one heading toward morbid obesity--who were selecting snacks to take to their seats. Another passenger appeared and stood several feet behind me, near the entrance. After what seemed like a long time, the party of three paid, collected their purchases, and turned to leave. Amazingly, just as the mom cleared the door and the teens were still blocking me, the passenger who had entered after me, raced ahead and began placing his order with the somewhat startled attendant. I stepped forward and said, "Excuse me, but I'm ahead of you in line." He replied, "Oh, that's right!" as if he somehow forgot. I like to think all the pushy, obnoxious people I meet are fundamentalist-nationalist-caveat-emptor capitalists like Pat Robertson and Cal Thomas. Returning to my seat in the observation car, I was happy the half-full can of beer I left on the table with my notebook and pen hadn't spilled in my absence. The train made a continual noise and swayed a bit but offered a quieter and smoother ride by far than any jetliner I've been on. Signs in the distance announced our approach to Wisconsin Dells, the closest America's Dairyland comes to a full-tilt, tourist-milking operation like Disney World. I could see the Wisconsin River and some of the water-carved sandstone formations that are the town's primary attraction rising from its banks. "The railroad made plans to bridge the Wisconsin River near the river's dells, and a boomtown named Newport sprang up at the expected site of the bridge in 1853...but when the railroad finally came through the area in 1857 it took nearly everyone by surprise by crossing the river a mile upstream from the site of Newport. As a result, Newport was rapidly turned into a ghost town as the settlers flocked to the new city at the site of the railroad bridge, Kilbourn City." The town was named after Byron Kilbourn who was the president of two railroads at the time and one of the founders of the community later called Milwaukee. 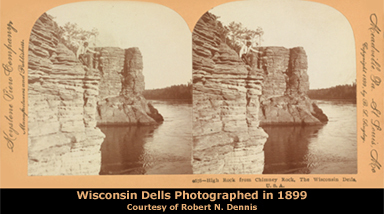 Gradually, tourism became Kilbourn City's primary business, and to make it easier for tourists to connect the place with the natural landscape bringing it fame, the name was changed to Wisconsin Dells in 1931. Just before we reached town, I noticed a line of deciduous trees bordering the track that had been trimmed carelessly because of the power lines that ran through them. It was a sorry sight and yet another dark mark on the long list of human cruelties to the environment. The train stopped at the Wisconsin Dells Station and across the street I could see--no foolin'--the Torture Museum!—a great place to take the kids! Oddly or not, the Dells Bells Wedding Chapel was close by and sported a sign reading: "Welcome to Fabulous Dells Bells Wedding Chapel." As we eased north again, an old-fashioned auto salvage yard appeared just beyond the Dells' northwestern edge. Probably it isn't visible from the highway but what a sight from the Empire Builder. Dilapidated cars were in some instances nearly obscured by prairie grasses that grew higher than their roofs. I visited the lower level of the lounge car again and the somewhat straight-laced attendant frowned when an impatient passenger wearing a Goonfest T-shirt complained he had been waiting quite a while. The attendant served me quickly enough. At about 6:30, we reached Tomah which still has a quaint train station that a website states was built "in the early 1900s." It looks a lot like the one in the old village area of Brookfield, now closed, that was built in 1867. An Amish buggy with a single male occupant was waiting at a crossing with cars and trucks as we pulled out of Tomah's north side. 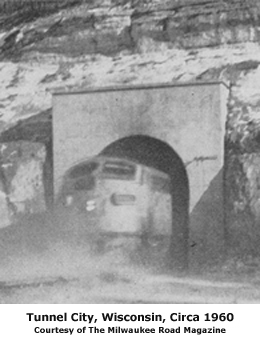 Tunnel City appeared next and its namesake is an engineering feat of large proportions, considering it was completed in 1861. Jarrod Roll, director and county historian at the Monroe County Local History Room & Museum in Sparta sent photocopies of articles that appeared in the Monroe County Democrat and Badger History. One reports the tunnel is 1,330 feet long, 243 miles from Chicago, and that the next tunnel on the run is 1,399 miles from Chicago. The Empire Builder passed Fort McCoy at 6:48 and Sparta at 6:51 and reached La Crosse's city limits at about 7:05. It was still light, and a crescent Moon was visible in the west. We came upon another train track running at right angles to the one we were on and, oddly, a train was waiting for us to pass, just as motor vehicles do. Moving into La Crosse, I was struck by the poor construction of the houses along the tracks, many barely more than shacks. When the train stopped at the station, its final cars blocked a city street and automobiles had to wait until it moved on, no doubt a source of irritation to residents. A number of waterways are crossed on the way out of town, starting with the Black River and French Slough and ending with the East Channel and West or Main Channel of the truly mighty Mississippi. The train trestle on the last has a section that pivots to parallel the river and allow barges through. In the distance beyond tawny sandstone outcroppings along the track, a long and low carrier was visible heading up river as we left the city. Calls for dinner came regularly and finally passengers with an 8:30 p.m. reservation were summoned. When I reached the dining car after making my way through several passenger cars, a nice hostess took my name, walked me toward the locomotive end and, to my surprise, seated me at a table already occupied by three dinners--I took the empty chair. My companions--the Stackhouses--were affable and if they were bothered by my joining them, they didn't show it. The friendly trio comprised a dad, mom, and son, all from Peru, Indiana, who were traveling to Minneapolis to spend Labor Day weekend with another son who lived in a northern suburb. They commented on the beauty of Wisconsin Dells and the number of water parks. Mom said she had visited once but hadn't seen much other than the interior of the Ho-Chunk casino. She was a freelance writer, too. I had a salad and salmon and the food and service were excellent; any stationary restaurant would be hard-pressed to match the decor passing by the dining car's big windows. Total cost with another beer and tip was about $33.00. My dining companions said they had traveled to see the son and brother by automobile and plane and now were trying the train, which they seemed to like. We had a pleasant conversation, another of the ride's many charms. It was beginning to get dark as we continued north along the Mississippi. With lights from the Twin Cities visible in the distance, the train slowed, possibly to avoid other trains ahead or to stay on schedule and arrive in the double metropolis at 10:31 p.m. sharp, as it ultimately did. Detraining occurred at Midway Station, named for its location between the downtowns of Minneapolis and St. Paul. After a short walk, I hailed a taxi in the parking lot and soon was at my hotel in Dinkytown, said to be where Bob Dylan lived during his brief time as a student at the University of Minnesota. I was staying at the University Inn, 925 4th Street SE (one of the thoroughfares Dylan might have had in mind when he wrote "Positively 4th Street"). The doors were locked when I arrived, and there was no obvious buzzer. A desk clerk was visible watching television at the far end of the lobby, but pounding on the door failed to get his attention. I walked around the building and banged on the glass nearer the clerk. When he saw me, I returned to the door and he buzzed me in. It was about 10:45 p.m.
My room was a clean, neat, quiet kitchenette and everything worked. I highly recommend the place. It was raining the next morning at 5:00 a.m. when I went to the lobby. The desk clerk from the night before was still on duty. He asked, "Why are you up so early?" I explained my mission and mentioned that I planned on taking a bus to Troy's apartment. He said the stop was across the street. When I observed he worked long hours, he introduced himself as Jim Salovich and said he co-owned the hotel with his brother. I understood. I paid and walked across the street to wait for the bus. Rain was falling lightly when the first pulled over. I asked the driver if she would get anywhere near my son's address; she said no and added that the next bus that was scheduled to come by would. Sure enough. After about 15 minutes, I was aboard and it dropped me within about five blocks of my destination. Troy already had the U-Haul packed and ready except for loading Noche. Soon the Twin Cities were disappearing as we headed east toward Wisconsin. The trip home was familiar from the many times we had visited Troy. Noche, as is often the case with cats, wasn't a happy passenger, but he got used to it or simply grew tired of meowing with no effect. Unlike the completely new and fascinating Amtrak ride, the journey back was mundane. But on the bell curve of travel stories, that tends toward the good end. Traveling on the Empire Builder 7, however, pegs the needle. Now when I hear the Amtrak whistle blow, I think of travelers passing quickly through Brookfield on their way to points north, west, south, or east. Maybe they're sleeping, reading, having a drink or dinner, talking with friends old and new, or simply watching the world roll by without--at least for the moment--a care in their gently swaying and undulating world.